There are lots of ways to celebrate the holidays here in the Portland metro area. Some events like the Second City’s performance of Twist Your Dickens are very Portlandia-like. Others like the Oregon Ballet’s The Nutcracker are classic. Take your pick of offerings that are sure to fill you with holiday cheer and an urge to wish someone a happy holiday! FIFTH ANNUAL GREAT FIGGY PUDDING CAROLING COMPETITION. While it’s too late to enter (put that on next year’s holiday bucket list), you can attend this homegrown talent holiday version of The Sing-Off. Caroling groups gather at assigned spots along the Portland Transit Mall (SW 5th and 6th Avenues and SW Yamhill and Morrison) to perform for onlookers as well as the Dickens Carolers who will select the top three groups to take the stage in Pioneer Courthouse Square where audience applause will determine the winner of the $1,000 grand prize. Friday, December 7. Carolers compete from 6:00 p.m. to 7:00 p.m. Top three perform at 7:15 p.m. UGLY SWEATER DASH. Time to go public with that gaudy thing you tuck away every year in order to pull out during the holidays and be made fun of. Wear it with pride in West Linn’s festive event that precedes their Holiday Parade. Saturday, December 8. 5K Walk/Run begins at. 9:00 a.m.; 1 mile Dash starts at 9:30 a.m. Check online for different fees. Start and finish at the Willamette Fire station on Willamette Falls Drive. Holiday parade begins at 10:00 a.m. TWIST YOUR DICKENS. The Second City improv group stages this parody of A Christmas Carol and other Christmas traditions that will leave you laughing. Performances at 7:30 p.m. on Tuesdays through Sundays and 2:00 p.m. on Saturdays and Sundays, Thursdays at noon through December 23. Check online for pricing and tickets. The Armory, 128 NW Eleventh Avenue. PITTOCK MANSION CHRISTMAS: HOBBIES AND PASTIMES. Volunteers have decked out this popular Portland destination for the holidays featuring popular (knitting) and more obscure (beekeeping) hobbies and pastimes. Open from 10:00 a.m. to 4:00 p.m. through December 31. Tickets online. 3229 NW Pittock Drive. CHRISTMAS IN THE GARDEN. Take the family for a drive down to Silverton and enjoy a festive holiday evening that includes live music, artisan vendors, ice skating, snowless tubing, a 100 foot long candy cane tunnel and one million lights. Activities and pricing vary by night. Open through December 31. 879 W. Main Street, Silverton. FESTIVAL OF THE LAST MINUTE. Portland’s popular Saturday market makes a holiday appearance just in time to save the day for procrastinators. In addition to handcrafted gifts you’ll enjoy the sounds of roving carolers and a chance to visit Santa. Open 11:00 a.ma. to 5:00 p.m. starting December 19 through December 24. Closes at 4:30 on December 23 and 3:30 on December 24. 2 SW Naito Parkway. ZOOLIGHTS. Not to be outdone by the one million lights at The Oregon Garden, the zoo incorporates 1.5 million LED lights into its annual holiday display. Added attractions include the carousel and train rides. Lines for those can get pretty long, so plan your strategy accordingly. Special zoolight admission prices online. Lights go on at 4:00 p.m. until zoo closing at 9:00 p.m. (8:00 p.m. on value nights) through January 5. 4001 SW Canyon Road. WINTER WONDERLAND. Speaking of lights, the Portland International Raceway features the largest light show west of the Mississippi with over 250 light set pieces and scenes that you can enjoy from the warmth and comfort of your car. Open through December 26 on Sundays through Thursdays from 5:30 p.m. to 9:30 p.m.; Fridays through Saturdays from 5:00 p.m. to 11:00 p. m. Admission: $20/car onsite; $18/car online (plus service fee). 1940 N. Victory Blvd. THE NUTCRACKER. It doesn’t get more traditional than this and Oregon Ballet Theater’s interpretation will surely not disappoint. Matinee performances at 2:00 on December 8, 9, 15, 16, 20, 21, 22, 23, and 12:00 noon on the 24th. Evening performances at 7:30 on December 8, 13, 14, 15, 16, 20, 21, 22, and 23. Tickets online. Keller Auditorium, 1111 SW Broadway. AFTERNOON TEA. Take a break from shopping or just give yourself an excuse to get dressed up and practice your manners celebrating this British tradition in Portland style. Check out the offerings at Hotel deluxe, 729 SW 15th Avenue or the special holiday weekend tea service at Pix Patisserie, 2225 E. Burnside. 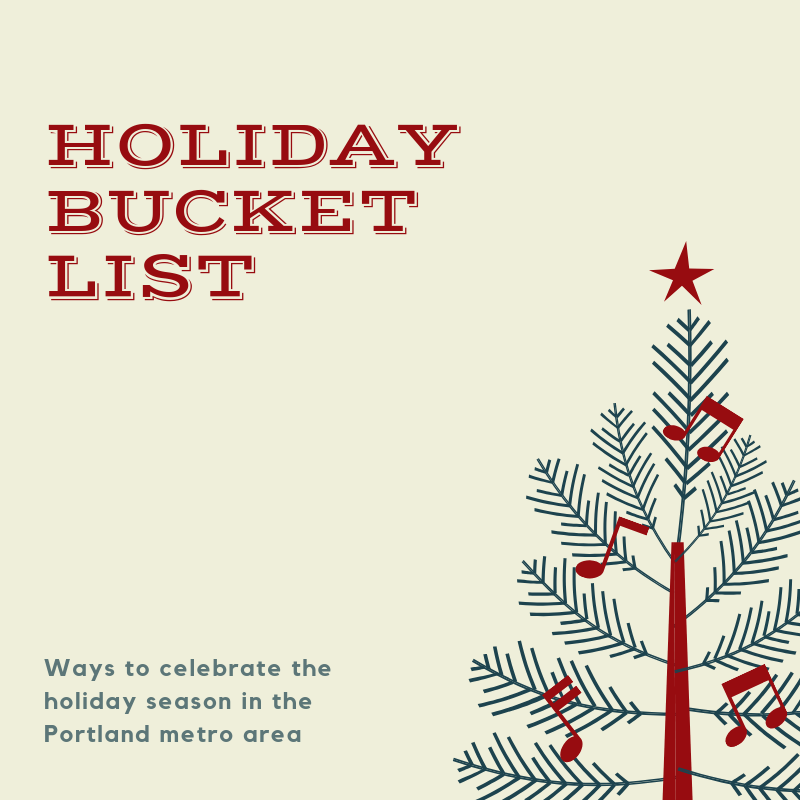 Have any holiday events you think should be added to this bucket list? Leave your comments below. This entry was posted in Holidays in Lake Oswego and tagged Holiday activities Portland Oregon, Holiday events in Portland Oregon, Lake Oswego Oregon, Things to do in Portland during the holidays. Bookmark the permalink.